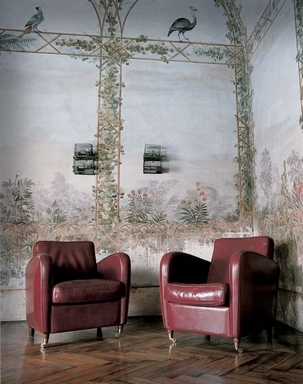 I wonder whether the photo below depicts a wallpaper or a painting on the wall. In any case, it has a nice garden feel, while looking at it you can imagine these birds and plants being real pets in your home. Can a drawing replace real nature? I think that there is a case when they can: if you are the kind of person for whom the downsides of messing with real animals and plants in your (presumably small) apartment outweight your desire for being closer to nature. But having a big house with a real garden is still better.